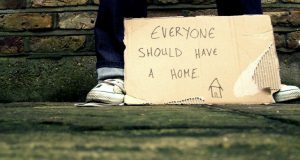 Homelessness does not discriminate… Regardless of religious beliefs o not beliefs at all, no matter your race or ethnicity, socio-economic status, homelessness could affect anyone given the unexpected and difficult set of situations. A homeless person is, “an individual without permanent housing who may live on the streets; stay in a shelter, mission, single room occupancy facilities, abandoned building or vehicle; or in any other unstable or non-permanent situation” (National Health Care for the Homeless Council). Homelessness can be cause due to unexpected incidences or situations where a person not necessarily have the power to prevent it or control it; for instance, the loss of loved ones or their job, depression, mental illness, domestic violence and family disputes, depression, post-traumatic stress disorder (PTSD), physical disabilities, and natural disasters (Home Aid). Community psychologists work hard to provide healthier and productive lives to communities, while also promoting a sense of belonging and opportunities for social change. Homelessness is a social issue that has been addressed by community psychologists due to the issue being like a tree that unfortunately has many branches which can then ‘grow’ into creating not only issues within the individual who is experiencing homelessness but the community as a whole. In the pursue of new paradigms, along with [mostly] non-profit organizations, community psychologists have been studying and addressing homelessness from every point of view; especially, using qualitative research as their method, “to understand the values, interests and meanings that underlie language, discourses, and texts” (Nelson & Prilleltensky, 2010, p.263). In simpler words, they place the values within individuals before the statistics. As part of a constructivist paradigm, community psychologists have the change to interact, learn from the homeless individuals’ experiences, as well as questioning what does this experience means to them in order to provide them with more support and other ways to fight for their right and human dignity. Nelson and Prilleltensky (2010) consider this paradigm as, “an approach that has more kinship with the humanities than the hard sciences” (2010, p. 262). The Housing First model is a representation of a constructivism paradigm because it does not require people experiencing homelessness to address the all of their problems including behavioral health problems, or “to graduate through a series of services programs before they can access housing” (National Alliance to End Homelessness). Using a local example, there are some other organizations, such as House of Hope, Lowell Transitional Living Center, Girls Inc, Alternative House (and so forth) that also promote this paradigm. Taking UTEC’s Streetworker program as an example, they provide workforce development and educational services to at-risk young men/women (ages 16-24). UTEC works aside with community partners to help these young individuals to get into a stable housing, as well as providing addiction treatment programs. Overall, community programs and organizations, as well as community psychologists adopt this method to not only helping the most vulnerable ones with offering a roof over their heads, but the opportunity to be heard and helped in a more individual, personal way. In brief, to keep perusing new paradigms to end homelessness, one community at a time. Geoffrey Nelson, Isaac Prilleltensky. (2010). Community Pasychology: In Pursuit of Liberation and Well-Being (2nd ed.). New York: Palgrave MacMillian.